Cruz, J.L., Alves, A.A.C., LeCain, D.R., Ellis, D.D. and Morgan, J.A. 2016. Elevated CO2 concentrations alleviate the inhibitory effect of drought on physiology and growth of cassava plants. Scientia Horticulturae 210: 122-129. Writing as background for their work, Cruz et al. (2016) say that the ongoing rise in atmospheric CO2 "is hypothesized to stimulate net photosynthetic CO2 uptake and, consequently, promote increased biomass production and yield of C3 crops," citing the works of Kimball et al. (2002), Long et al. (2004), Rosenthal et al. (2012) and Cruz et al. (2014). However, discussion remains as to the strength of such growth benefits when growing conditions are less than ideal. And, thus, it was the objective of this team of five researchers to examine the interactive effects of elevated CO2 and water stress on the growth, physiology and dry matter production of an important food crop - cassava (Manihot esculenta). Working with variety CM 507-37, Cruz et al. exposed approximately 3-month-old cassava plants to either ambient (390 ppm) or elevated (740 ppm during 06:00 to 18:00 hours only) CO2 concentrations in a climate-controlled greenhouse environment at the USDA-ARS Crops Research Laboratory in Fort Collins, Colorado, USA, for a period of 100 days. Thirty days into the experiment, water deficit cycles were introduced, where half the plants in each CO2 treatment were denied irrigation for seven days, followed by daily irrigation to reach field capacity for seven days. In all, five such water deficit cycles were introduced over the course of the experiment. Results of the experiment revealed that elevated CO2, in the words of the authors, "delayed the onset of water deficit in cassava by reducing the stomatal conductance and decreasing the transpiration rate." In addition, elevated CO2 increased net photosynthesis and instantaneous transpiration efficiency, which positive effects improved the biomass production of plants grown under elevated CO2 during water deficit. Consequently, as shown in the figure below, under well-watered conditions, elevated CO2 stimulated total dry mass production by 20%; but under water-stressed conditions "the positive effect of elevated CO2 levels on the dry matter production was 61% higher for the stressed plants." And in light of these several findings, Cruz et al. conclude that "an increase in the atmospheric CO2 level will increase [the] water use efficiency of cassava and hence the crop performance under water deficit conditions." And that is great news, indeed, for those who grow (and consume!) this important crop in semi-arid areas. Figure 1. 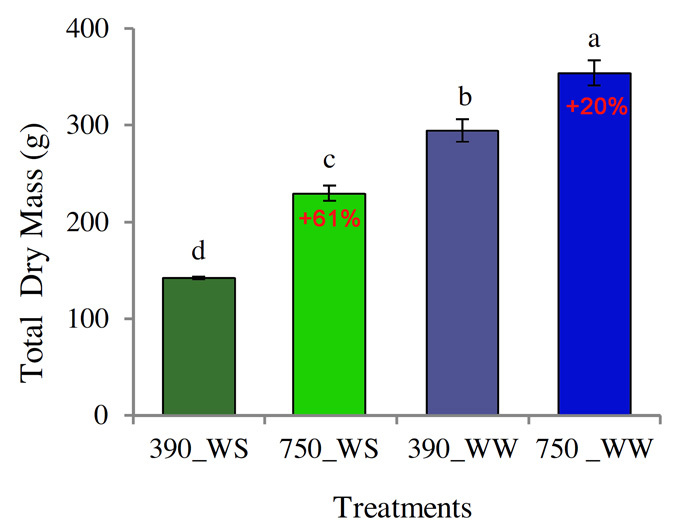 Effects of atmospheric CO2 (390 and 750 ppm) concentrations on the total dry mass production of cassava plants grown under well-watered (WW) and water-deficit (WS) conditions. Different letters accompanying each bar indicate a significant difference (p ≤ 0.05). The percent change in total dry mass production due to elevated CO2 at each water treatment is presented in red text. Adapted from Cruz et al. (2014). Cruz, J.L., Alves, A.A., LeCain, D.R., Ellis, D.D. and Morgan, J.A. 2014. Effect of elevated CO2 concentration and nitrate: ammonium ratios on gas exchange and growth of cassava (Manihot esculenta Crantz). Plant and Soil 374: 33-43. Kimball, B., Kobayashi, K. and Bindi, M. 2002. Responses of agricultural crops to free-air CO2 enrichment. Advances in Agronomy 77: 293-368. Long, S.P., Ainsworth, E.A., Rogers, A. and Ort, D.R. 2004. Rising atmospheric carbon dioxide: plants FACE the Future. Annual Review of Plant Biology 55: 591-628. Rosenthal, D.M., Slattery, R.A., Miller, R.E., Grennan, A.K., Cavagnaro, T.R., Fauquet,C.M., Gleadow, R.M. and Ort, D.R. 2012. Cassava about-FACE: greater than expected yield stimulation of cassava (Manihot esculenta) by future CO2 levels. Global Change Biology 18: 2661-2675.